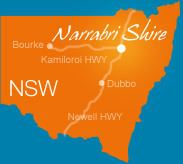 Narrabri Shire Council has developed an interactive map showing Council's planned Capital Works projects over the current financial year..
Every year, Council invests a considerable amount in improving instructure throughout Narrabri Shire. These works are planned in advance through Council's four-year Delivery Program. This year, in particular, there are a number of notable projects across the Shire. Council has developed this interactive map to help local residents see what capitals works are planned in their neighbourhood. The map does not feature details of the normal maintenance programs undertaken by Council on an annual basis but the major improvements and investments being made in infrastructure for the future. This project has been part of a continued effort by Council to keep the community informed and engaged with what is happening in Narrabri Shire. The map has been updated to reflect works for the current financial year. Simply click and drag the map around to view the town or village of interest and then zoom in to see the projects. You can zoom in and out by using the + and - icons in the bottom left-hand corner of the map. Project sites are highlighted with a coloured icon - the different colours pertaining to the type of works (roads, water etc). To view details of the project, click on the icon and you will see details of the project including a description of the works and proposed budget. To view details of all Capital Works for the current financial year click on the icon in the top left-hand corner of the map next to the title. You will see the list of the different colours and what types of works they relate to. Click on the down arrow next to all items to view the list of works for that year. At the bottom of that panel you can click on the satellite image photo to view the map as a satellite image. To view the map in full screen click on the icon in the top right-hand corner of the screen below.